Don't Forget! Tomorrow we go to see The Tale of Despereaux at the Chanhassen Cinema. The bus will leave Shirley Hills at 9:00 AM and arrive at the theater at 9:30 for the 10:00 show. We plan on being back to Shirley Hills around 12:00. 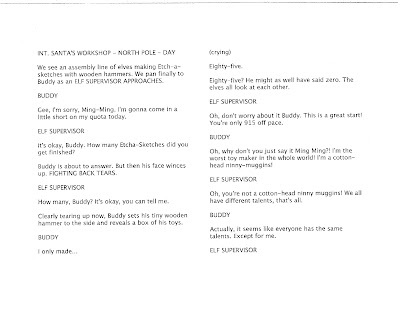 Here is a sample of a script from Elf taken from Script-O-Rama that we used for choral reading today. 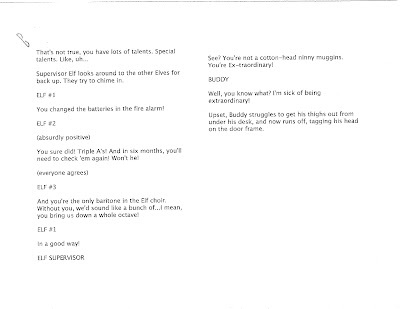 Thanks Lexie and Rachel for bringing in the DVD to share the actual scene with us.